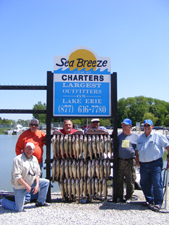 Why Book Your Walleye Fishing Charters With Sea Breeze? The largest full service walley fishing fleet in western Lake Erie. Guides are full-time fisherman (7days a week). 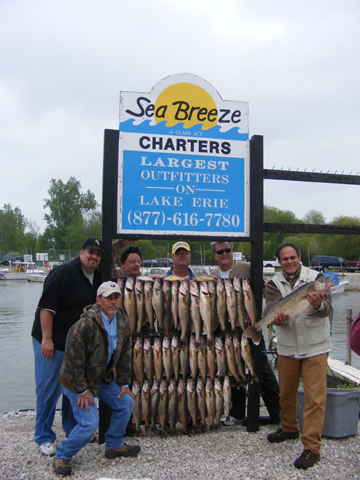 Guides have lifelong experience fishing on Lake Erie. 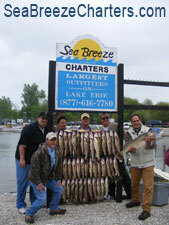 Full day fishing charters (even if you limit our early). Thirty boats to locate walley and other fish faster (to get you to the action). Boats are 30' long & 10' wide (w/Private Bathrooms). Shortest run to the walleye fishing reefs. (more fishing time). Many satisfied, repeat customers (ask for a reference list). Our marina has a restaurant & lounge. Our marina has a convenient store. Our marina has fish cleaning facilities. Sea Breeze lodging is within walking distance to the boat. Sea Breeze lodging has central air conditioning. Sea Breeze lodging has 2 bathrooms in each unit. Sea Breeze lodging has satellite TV. Sea Breeze lodging is within walking distance to fishing ponds.